Born in 1917 in Copenhagen, the screenwriter, director and novelist Ib Jørgen Melchior lives in his adopted hometown of Los Angeles with his wife Cleo Baldon. He has a life story that is in itself worthy of a movie: the son of a Wagnerian tenor, Melchior saw the classic American horror ‘The Man Who Laughs’ (by Paul Leni) in 1928 and became enamoured with motion pictures. After graduating from Copenhagen University, Melchior began travelling as a theatre actor and this eventually took him to Broadway. In 1941, Melchior joined the war. He became decorated for his services within the ‘Office of Strategic Services’, which would eventually become known as the CIA. Later in New York, Melchior worked as a director in live television before heading to Hollywood to realise his dream of directing for the cinema. Upon his arrival he soon discovered that despite having worked as a director in New York, one needed to be a union member in Hollywood in order to direct a film there. However, without a Hollywood directing credit, it was impossible to join the union. Producer Sid Pink, well-known for his frugality, agreed that if Melchior could deliver a script at minimum cost, he’d allow him to direct it – for minimum payment. That film was ‘The Angry Red Planet’. It was a box-office success and AIP (American International Pictures) commissioned two more films from Melchior and Pink. Their next film was to be ‘Reptilicus’. Melchior recycled many elements from his abandoned script called ‘Volcano Monsters’ and, thanks to contacts in Denmark, he enabled Pink to generate Danish finance for what would be a rare Danish-American co-production. It would be shot at key locations around Copenhagen with both Danish and English language versions made simultaneously. The narrative follows the discovery by miners of an ancient reptile frozen underground. The beast’s tail is returned to Denmark’s Aquarium, which serves as the central location for most of the film’s narrative. Under closer inspection, scientists learn of the creature’s ability to ‘regenerate’. Like a starfish or a worm, Reptilicus can grow a whole new self from any severed part. Before long, the tail has grown a body and Copenhagen is host to a pre-historic monster. Despite the understanding that this would be Melchior’s next film as writer-director, Pink made the surprise declaration that he was to act as both producer and director of the picture. Pink had never directed a single frame of dramatic fiction before, nor did he understand a word of Danish. Understandably Melchior was concerned. “It takes more than just wanting to direct a film, you have to have some knowledge of it, but unfortunately Mr Pink had none,” he recalled. Pink also credited himself as co-writer, but as Melchior recalls, Pink’s only contribution to the writing was the removal of anything he feared he couldn’t handle directing. Melchior recounts (undoubtedly with some amusement) one anecdote that clearly illustrates the extent of Pink’s inexperience. 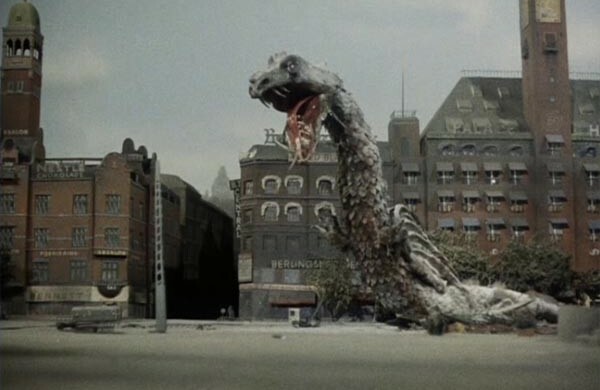 During the filming of a set-piece involving hundreds of extras and the raising of the Langebro Bridge, supposedly as a means of preventing Reptilicus crossing it, the nation’s press were gathered. Many athletes were poised to hurtle themselves off the end of the bridge in this huge scene, which one could really only shoot once. Pink and Melchior rarely spoke following their commitment to AIP. Melchior was awarded the Golden Scroll (now Saturn Award) in 1976 from the Academy of Science Fiction for his body of work. By that time Pink had become an exhibitor, running cinemas in Puerto Rica and Florida, before passing away in 2002. Ironically the credit ‘Produced and Directed by Sidney Pink’ follows shortly after. Ib Melchior’s 2009 book ‘Six Films From The Sixties’ chronicles the production of ‘Reptilicus’ in great depth. A special thanks to Brett Homenick and his excellent blog sidelongglancesofapigeonkicker.blogspot.com for kind access to his interview material.